The Net Employment Outlook for 2018 for Australia has improved compared to CY2017—Employment Outlook peaked at 13% (a six-year high) in March 2018, before falling to 11% in September 2018. Unemployment rate decreased to 5.0% (a six-year low) in September 2018 from 5.5% in August 2017. Seek is the dominant player in the job boards industry, while LinkedIn is a dominant player in the Professional Networks space. 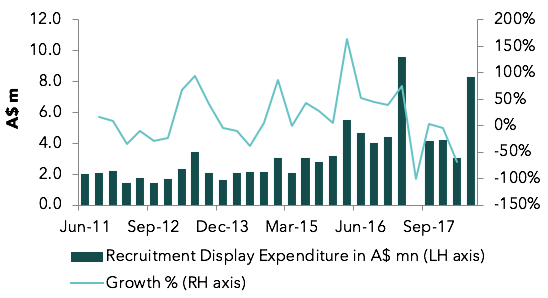 While alternative job boards exist, they are unlikely to challenge Seek’s dominance at least in the Australian market. Artificial Intelligence and Machine Learning are transforming the industry by allowing recruitment companies to offer better job recommendations and data driven insights.